The museum is dependent upon its strong group of volunteers. 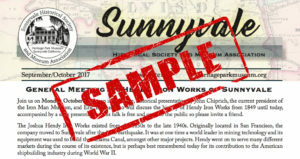 Membership to the Sunnyvale Historical Society and Museum Association helps to support our daily operations. Consider becoming a member or giving the gift of membership to someone special. Remember that your membership is tax deductible. You can either sign up online or come into the museum gift shop to complete the form. To sign up here, first choose your membership option, and then click BECOME A MEMBER! below. If this a renewal membership, please add YES in the Renewal Membership Blox below. If this is a Gift Membership or in tribute to someone, please add the recipient info in the Add a special message Section when completing the transaction on PayPal. We thank you for joining our group of members; your support is appreciated.